I have a food love affair with breakfast hash combinations. Roasted potatoes that are crisp on the outside and tender inside, tossed into a skillet with piping hot crisp vegetables and whichever meat or bean sounds good at the moment. Served just as often for breakfast as for dinner, hash is a lousy name for one of my favorite foods and I serve it at least a couple times every month. 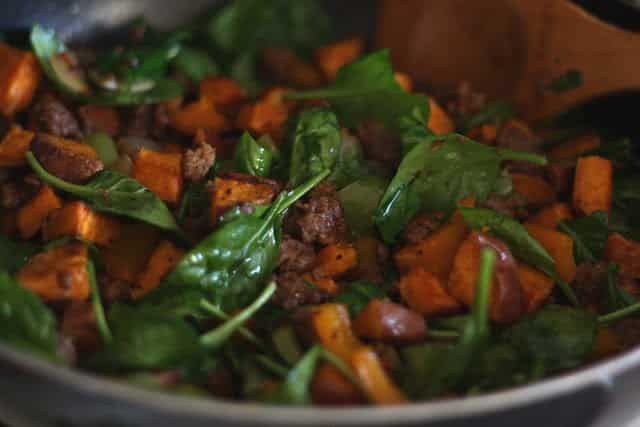 I made this meal a few nights ago and fell in love with sweet potatoes all over again. I assumed that I’d posted this combination last year, but when I checked it wasn’t posted. Too impatient to even set a plate on the counter for a picture, I’m giving you a skillet shot just so I can write down the recipe for next time. I just can’t have enough recipes for hash! The recipe I posted One Year Ago Today was a breakfast potato skillet. 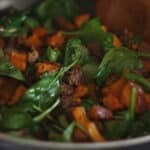 I have recipes using red or white potatoes, there are sweet potato combinations, versions with mushrooms, fancier breakfast hash with smoked salmon or inexpensive versions loaded with beans. If you are in the mood for it, there is bacon in this one and this one and this one. That’s more than enough links for one post, but if you still want more ideas, there are plenty more breakfast skillet ideas in the Recipe Index. Preheat the oven to 425 degrees. Place the potatoes in a large mixing bowl and drizzle generously with oil, using your hands, toss the potatoes thoroughly to coat. Sprinkle with 1 teaspoon salt and 1/2 teaspoon pepper and toss again. Spread the potatoes across a silpat lined baking sheet (if you do not have a silpat mat, generously grease the baking sheet with oil). Roast for 30 minutes, stir with a spatula and then return to the oven. Roast another 15-25 minutes and then remove from the oven. Stir again with a spatula. During the last 20 minutes while the potatoes are roasting, start cooking and crumbling the sausage in a large skillet over medium high heat. Once the sausage is finished, add the onions and cook for a few minutes until they are tender. Add the peppers and season with the remaining salt and pepper. Continue tossing and cooking for 4-5 minutes. When the peppers are slightly tender and still a bit crisp, remove from the heat. Add the cooked potatoes and toss to combine. Add the spinach and toss for 1-2 minutes until it begins to wilt. Serve immediately. Enjoy! I bet the pork sausage rendered fat makes those sweet potatoes taste so good! This looks amazing! How tasty would this be with a poached egg on top too?! Good recipe. But why *kosher* salt...and sausage? I think you missed the irony. Sausage is NOT kosher. It's anti-kosher, in fact. Yes, kosher salt is still a good, practical salt to have and use for a variety of reasons, but it's a bit ironic in a dish like this. What kind of sausage do you recommend? This was fantastic!! I subbed squash for the peppers. Thanks for sharing! !